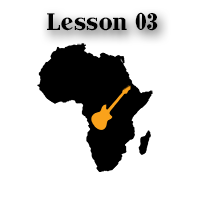 The 3rd piece of the African polyrhythmic guitar series. Yes, there are three of them, each one is slightly different, so they (hopefully) teach you something new as you advance. Let’s pretend. Anyway. 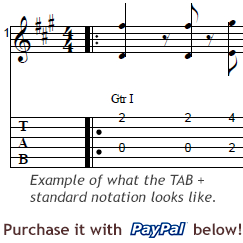 As you can see in the video and the TAB, the picking hand is doing pretty much the same as in the previous lessons. The thumb is doing the “threes” on the lower string, and the picking fingers play the melody with the “twos”. What are these numbers? Well, we are still in the 2 over 3 polyrhythm mode. So far so good, hey? This piece has a softer mood, thanks to the minor chords. Does that mean it sounds sad? You be the judge. I think it has a West African sound, sort of. Careful with those string changes with the thumb. It takes some practice to have the pattern down, but your patience and following the TAB will help, tremendously.